Several buildings were made smaller. Relocating the playground and community building away from Tower Road and closer to the Depot Café and Greenway parking area. Adding a distinct entryway and expanding the village green. Reducing retail space (the biggest driver of traffic) from 185,200 sf net to 115,000 sf net. Reducing the number of housing units from 822 to 800 but keeping the originally proposed 123 affordable units. The memo explains that the proposed changes were made after getting feedback from the council, peer review teams and public. They will outline the changes to the Land Use committee on Tuesday Feb. 12, 7 pm at City Hall and follow that next month with more specifics. It’s moving in the right direction. Although a reduction of 22 housing units [down to 800] won’t really help mitigate the impact of this project on Newton schools. The City needs to hold the developer’s feet to the fire until they include new school space. Also, the developer needs to get real about affordable housing. The number of affordable housing units they are offering is a joke. Newton should be working toward an independent, city-wide goal of 12.5% affordability, [as opposed to the 10% required by 40b]. So when a project of this magnitude is built, City leaders should be demanding 25% of the units be affordable. How does reducing the retail space so significantly compared to the residential, maintain an economically favorable commercial/residential balance? @Andrea: The (independent) peer review team hired by the city said they felt there was too much retail. Retail is traditionally a bigger contribuor to traffic than residential. And reducing the retail appears to allow for the elimination of the parking garage and 20 percent fewer overall parking spaces. And it creates more open/green space. @Neil: The school department has said it does not believe this project (as well as three other potential projects) will lead to school crowding. @Mike: We don’t need a new school. The schools are already overcrowded as a result of the increase in enrollment over a 10 year period and state mandated unfunded programmatic additions without adding capacity. This means that the schools need to be enlarged as they are rebuilt no matter what. The statement that the developments will not cause crowding is accurate in a sense – they may or may not cause more overcrowding – time will tell. But to deny that the schools are currently overcrowded is not a convincing argument for the developments. It should be noted that the enrollment increase occurred in specific communities that are desirable IMO because of their location and school quality – Brookline and Newton – and not just because of the boomer boomerang. The location will always remain a draw, but we need to continue to increase capacity with high quality school facilities. The School Committee said we didn’t need a new school when Avalon was proposed on Needham Street. But the opening of Avalon [with less than half the housing units proposed by Northland], meant that hundreds of kids spent their elementary school years in “modular” classrooms bolted to the walls of Countryside School. So the assessment of “need” is not always accurate, and in this context the word “need” itself is completely subjective. 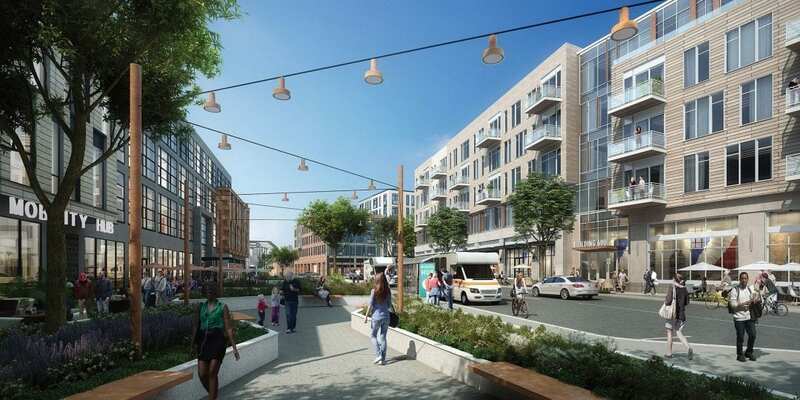 Northland is seeking to build a massive project in Newton. There is nothing inherently wrong with that. In my opinion, it would be a welcome change to upgrade those 25 acres of land that have historically been used principally for industrial purposes. Im all-in on the concept of a multi use development at that site. But a project of this size comes not only with promise, but with consequences as well. One of those consequences is the educational burden 800 housing units would add to Newton Public Schools. For the City to allow that to go unaddressed by this developer would be a tragic mistake. Rather than “need” to describe the problem, the word “capacity” is more accurate descriptor of the issues facing multiple elementary schools in the city. In addition to the increase in enrollment, the schools have had to accommodate new programs, often unfunded state mandates, that require additional space and staff. If you repurpose a classroom space to accommodate three programs that require teacher work space, small group instruction throughout the day, and instructional materials (learning center, Literacy specialist and aides plus a book collection for K-5 reading instruction, occupational therapist, for instance), one would be hard pressed to say you’ve served the students’ educational needs. However, at some point, justifying that the school facility has sufficient capacity to provide a top notch education becomes impossible. The schools and the developments are separate issues. School capacity needs to be addressed no matter what happens. It’s what the city has begun with Angier, Zervas, and Cabot. The use of space in these schools looks very different from that of a pre-1970 building. I read somewhere that building a deck over the pike would be 60million. It would be great for the city to allow more density in exchange for building low rise commercial building plus public space over the pike. Right you are Mike Striar! The “temporary” modulars, which lend an education trailer park flavor to Countryside, are still there. I think they do get a fresh coat of paint slapped on them each year though. A fresh coat of paint will make just about anything look good….for a while. who wins this game of chicken, with higher consequences. I will say this without hesitation: despite what any school enrollment study says, Countryside will get the bulk of whatever K-grade 5 kids come out of those apartments. Count on it. Furthermore, the school will receive no additional resources to handle any influx of kids. Count on that too. Your pols care deeply about equity, so they wont insist Northland or the school Dept pony up any needed resources because that would be unfair to students attending newly built or soon to be built schools in other parts of the city. group called CORD organized to oppose the stop & shop in favor of Avalon Bay, and these neighborhood activists took a powder on advocating for their local school(s), because their kids no longer attended them. I’ve teed this up quite nicely, cant wait to see how it all rolls out…. Anyone want to predict who will be standing along the developers with their shiny new shovels when they break ground? @Mike Striar – I couldn’t agree more with your comments so eloquently expressed. Paul Green is also correct that Northland needs to come up with $$ and resources to meet an influx of a greater student population. Where are we going to build these new schools and who is going to pay for them? The crowding concerns at Countryside is real. We were there first thru fifth grade. The modulars are an embarrassment (especially in comparison to the tax bill we all contribute to). Pretty crowded at Brown Middle School as well now that we’re in eighth. The reduction proposed by Northland mirrors community participation. @Mike Striar is spot on in summing up the issue. Unfortunately community outpouring rarely leaves their living room. We need to do better. Our School Committee and other city leadership are NOT critical thinkers if they believe that this new development will NOT impact the schools dramatically. I think we have learned from prior experience that Avalon on Route 9 and Avalon on Needham Street have directly impacted our schools from K-12. And if that is how the leadership currently feels, then come election day, I hope that there are other people who will step up and run. Our kids are negatively impacted by learning in trailers, by having cafeterias and gymnasiums that are not large enough to host additional students. There are many vacant stores on Needham Street and other village centers so the push for additional retail concerns me. How many banks do we really need? Who is going to be able to afford the rent in these new retail spots? So between traffic, schools and current vacant storefronts, I don’t see how we can say this will be a positive impact on our community. What is the plan for filling these store fronts?